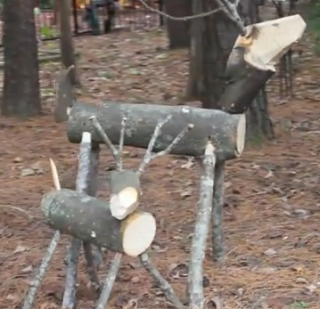 Here’s a great idea if you have a bunch of tree branches and limbs cluttering your yard from a necessary trimming or a wicked storm – make a tree branch reindeer! I like the little one best. This project looks a little scary because it involves a chainsaw. However, it shouldn’t be too bad if you use smaller logs and branches. Then you can use a smaller light duty chainsaw like the one they use in the video, which is about the size, and weight a short woman like mean could safely heft and weld. In other words, this looks like the perfect project for chainsaw beginners! If you are ever lacking confidence because life has handed you a big bag of the blues, the best way to banish them is to use any big, powerful power tool that makes a lot of noise! Vroom! Vroom! Disclosure: The companies mentioned in this video did not pay me or give me things to post thier video. I thought it was a cool project and wanted to share it with you because I think chain saws are kinda bad a$$ and will use almost any excuse to convince Husband that we need to buy one just for the sake of saying we own a chainsaw. I release this isn’t very frugal or green of me to admit I want a chainsaw just because, but this is supposed to be a disclosure statement so I’m disclosing - not so green thoughts and all.